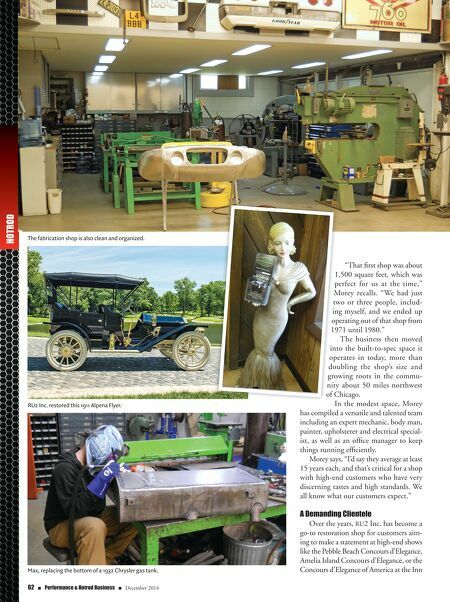 62 n Performance & Hotrod Business n December 2014 HOTROD "That first shop was about 1,500 square feet, which was perfect for us at the time," Morey recalls. "We had just two or three people, includ- ing myself, and we ended up operating out of that shop from 1971 until 1980." The business then moved into the built-to-spec space it operates in today, more than doubling the shop's size and growing roots in the commu- nity about 50 miles northwest of Chicago. In the modest space, Morey has compiled a versatile and talented team including an expert mechanic, body man, painter, upholsterer and electrical special- ist, as well as an office manager to keep things running efficiently. 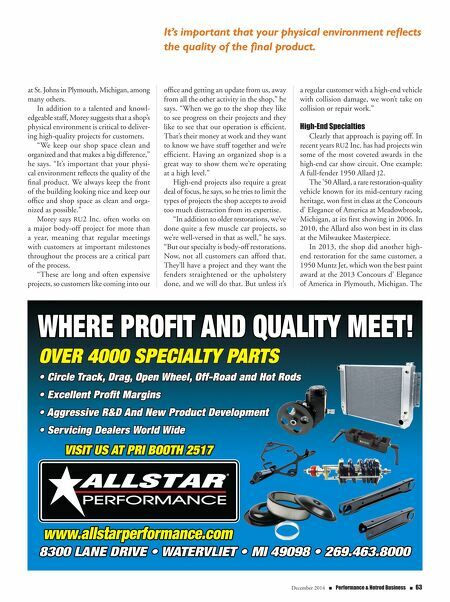 Morey says, "I'd say they average at least 15 years each, and that's critical for a shop with high-end customers who have very discerning tastes and high standards. We all know what our customers expect." A Demanding Clientele Over the years, RU2 Inc. has become a go-to restoration shop for customers aim- ing to make a statement at high-end shows like the Pebble Beach Concours d'Elegance, Amelia Island Concours d'Elegance, or the Concours d'Elegance of America at the Inn The fabrication shop is also clean and organized. RU2 Inc. restored this 1911 Alpena Flyer. Max, replacing the bottom of a 1932 Chrysler gas tank.